Are you interested in planning and implementing fitness programs to help people reach their wellness goals? If so, you might be interested in a career as an exercise physiologist. 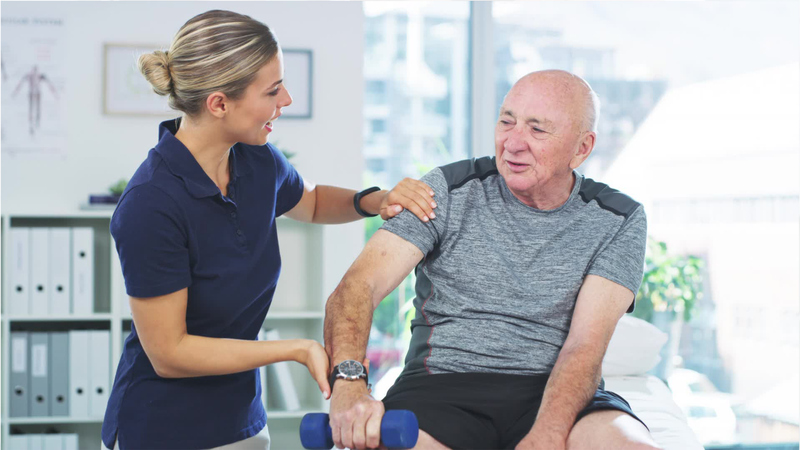 Exercise physiologists develop personalized fitness and exercise programs that help patients recover from chronic diseases and improve physical functions. They perform fitness tests, including measurements of body fat, blood pressure, oxygen usage, and other key patient health indicators. Many of their patients suffer from health problems such as cardiovascular disease, diabetes, a long-term disability, or obesity. Exercise physiologists bring their compassion to work, as they encourage patients to reach goals and overcome pain or discomfort. On a daily basis, exercise physiologists make decisions that could affect the future health or livelihood of patients. They must keep accurate records to ensure patients receive appropriate treatments. Strong communication skills help them develop good relationships with both patients and other medical staff. Exercise physiologists work in hospitals, outpatient clinics, and university laboratories. Most work full time, although about 40% of exercise physiologists work part-time. Entering the field of exercise physiology requires at least a bachelor's degree, including coursework in anatomy, science, exercise methods and medical terminology. A few states require licensure, although many states are considering creating licensure requirements. Develop exercise programs to improve participant strength, flexibility, endurance, or circulatory functioning, in accordance with exercise science standards, regulatory requirements, and credentialing requirements. Prescribe individualized exercise programs, specifying equipment such as treadmill, exercise bicycle, ergometers, or perceptual goggles. Interpret exercise program participant data to evaluate progress or identify needed program changes. See more details at O*NET OnLine about exercise physiologists. Exercise Physiologists by U.S. Department of Labor, Employment and Training Administration is licensed under a Creative Commons Attribution 4.0 International License.